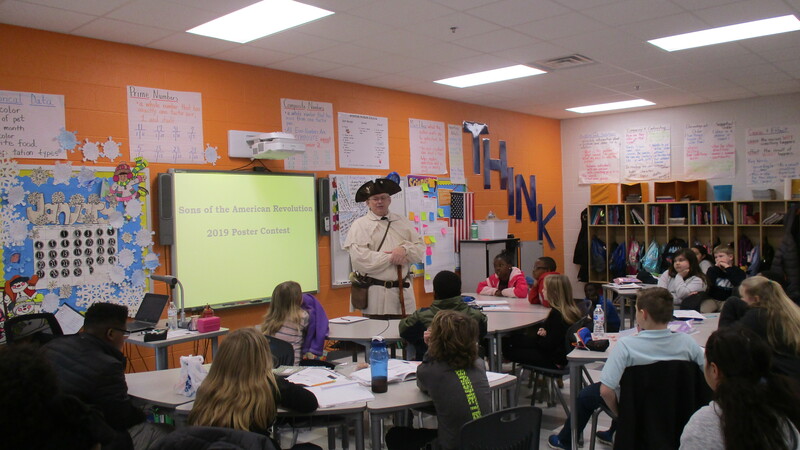 Manning ES 4th and 5th grade students were visited by Halifax Resolves SAR member Ken Wilson who informed them of the upcoming SAR Americanism Poster Contest. The theme this year is a Revolutionary War Patriot. After reviewing a few of the better known Patriots, such as Washington, Jefferson and Adams, Wilson encouraged the students to do a poster of their Patriot ancestor if they knew who they were. The SAR Americanism Poster Contest is conducted annually in the 4th & 5th grades to encourage the students to study our nation’s history. The chapter winner will be selected March 13th at the Halifax Resolves Chapter meeting. The NC winner will be selected in May following the Patriot’s Day ceremony at Alamance Battleground. The National SAR winner will be selected at the SAR National Congress in July.